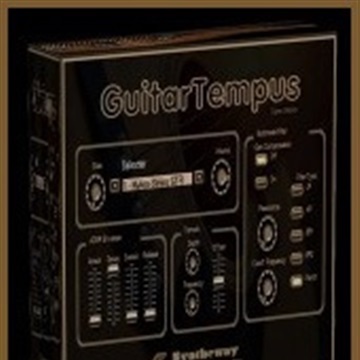 http://syntheway.com/GuitarTempus.htm - GuitarTempus is a virtual guitar VST plugin designed to emulate the acoustic (nylon, six and twelve steel string), semi acoustic (hollow body) and electric 'clean' guitars. The user interface includes a built-in: ADSR envelope, a LFO unit, a flexible Multimode Filter and a Glide control, offering a wide range of available sounds to expand a tailored guitar. - ADSR envelope generator. Attack, Sustain, Decay and Release parameters and several modulation targets. - Tremolo Section: Contains a LFO (Low Frequency Oscillator) with modulation depth, frequency and offset. This creates a kind of a “trembling” sound. Can be used to modulate a large number of target parameters. - Multimode Filter: A flexible multimode 'Infinite Impulse Response' (IIR) filter with LP (Low pass), HP (High pass), BP1 CSG (Band pass 1, constant skirt gain), BP2 C0PG (Band pass 2, constant 0db peak gain), Notch (Band-stop/Band-rejection) filters with adjustable Resonance and Cutoff Frequency range extends up to Nyquist. Gain Compensation option for LP, HP and BP1 filter types. - Glide (Portamento) Control: This function determines the amount of time it takes for the pitch of a played note to slide to the pitch of the following played note. - 32 Presets. Additionally, players can create different acoustic, semi acoustic and electric guitar sounds. - Full MIDI Automation: Complete MIDI Continuous Controller. You can use this to automate parameter changes from a sequencer, or to control your synthesizers from an external MIDI control surface.